As a contemporary artist, Leykun Girma is constantly experimenting with different techniques and mediums of painting. He expresses “Art is something that makes someone travel on his/her own free way. I look for inspiration from the environment and use my imagination to create my art.” Another focus of Girma’s paintings is women, because being raised by his mother helped him understand that women create an indelible impression on life. He loves and respects all women, because according to him, “Women are a source of wisdom and a symbol of wisdom. Girma was born in 1981 in Addis Ababa, Ethiopia. In 2000, while still a high school student, he won a poster contest award organized by the Chemical Society of Ethiopia. He studied at the Addis Ababa University School of Fine Arts and Design from 2002 – 2004 and then majored in Painting from 2007 – 2009 at the Entoto Technical and Vocational Training College of Fine Arts. Girma’s work has been shown in solo and group exhibitions, as well as art events. 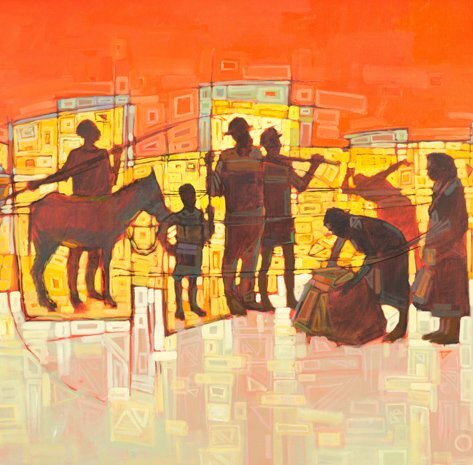 St. George Gallery has exhibited Leykun Girma’s work since 2012.